Born in New York City in 1926, Thomas S. Buechner attended Princeton University, The Art Student's League in New York and the Ecole des Beaux Arts in Paris. In Amsterdam he studied old master painting techniques with M.M. van Dantzig, a pupil of Max Doerner's. 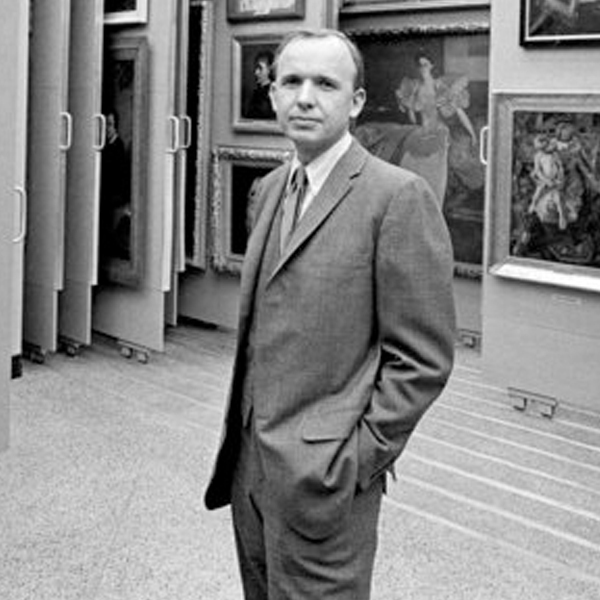 Subsequently employed as a designer and graphic artist on the Governor's staff in Puerto Rico, he specialized in exhibition design and was later appointed to the Display Department of the Metropolitan Museum of Art.nnThe first director of The Corning Museum of Glass (1950-1960) and then director of the Brooklyn Museum (1960-1971), Buechner simultaneously worked as an illustrator for the Chicago Tribunes's and the Washington Post's Book World and did cassette jackets for operas - a major interest of his. Painting full time since 1986, he is an established portrait, landscape and still life painter, Buechner has had many one man exhibitions in New York, throughout this country, and in Germany and Japan. He is currently represented by several galleries and portrait brokers (see Galleries). His paintings have been acquired by The Metropolitan Museum of Art and the Smithsonian's National Museum of American Art, among others. He taught in Frauenau, Germany 1988-2007 and teaches in Corning, New York. Tom and Mary Buechner were married in 1949 and have three children and seven grandchildren.